The Samsung Galaxy S5 runs on the latest available Android 4.4.2 KitKat customized by the most recent incarnation of TouchWiz for smartphones. Samsung has added multiple features that increase productivity and enhance security. The lockscreen no longer has widgets aside from a few special controls. 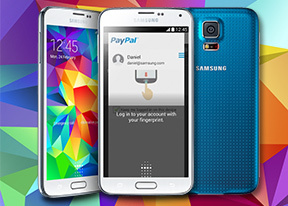 More importantly, you can now fingerprint-secure it - the Galaxy S5 can be set to recognize up to three fingerprints. If those fail for some reason (e.g. wet fingers), the phone will ask for a password so you'll never get locked out. Categories (e.g. News, Business, Facebook) are displayed as tiles, each displaying its top article. You can reorder and hide the tiles. Once inside an article, you can browse more articles in that category with the familiar Flipboard effect. The notification area is similar to what we've seen on Galaxy Pro tablets with its flat design and circular icons. The toggles work as usual and below them are two buttons (S Finder and Quick connect) and below that is the brightness slider, which can be hidden to save space, but you're stuck with the two buttons. There's a new feature called Recommended apps, which adds relevant shortcuts when an accessory is plugged, like the headphones. In the app drawer, icons are presented as a customizable or alphabetized grid and you can also view only the ones you've downloaded yourself. You can also disable some of the pre-installed apps so they won't take any RAM or appear in the app drawer. You can also hide icons to keep the drawer from getting cluttered. The Galaxy S5 has an App Switcher button that calls up a custom switcher UI. As usual, you can go into the task manager for more advanced controls. The Galaxy S5 comes with the Multi-window multitasking feature, which allows you to run two apps side by side. You can copy text between apps or snap a screenshot of one app and paste it in the other. If a pair of apps works well together (e.g. the browser and the email client) you can create a shortcut that launches both. Note that only select apps work with Multi-window but more can be found in the Play Store. There are no floating apps here, but there's something called Toolbox - a floating icon that shows a list of shortcuts once tapped. This is a quick way to get to some of the most commonly used apps.